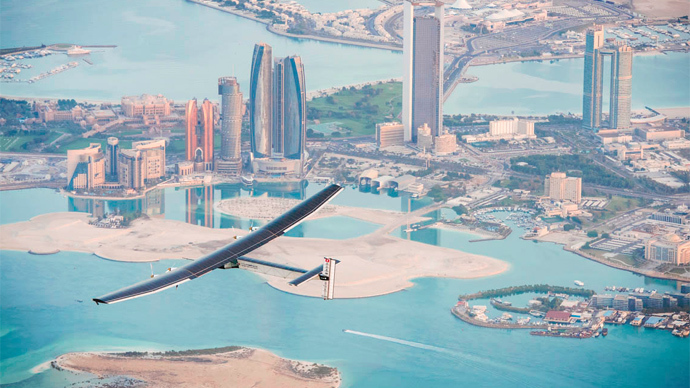 Solar Impulse 2 – a second generation of jet powered by solar energy – made yet another successful flight from the United Arab Emirates preparing for its main challenge – a journey around the globe. The plane’s third test flight from Abu Dhabi's small Al-Bateen airport was a debut for the company’s chairman Bertrand Piccard on this particular aircraft. He says the upcoming global flight should convince more people of the possibilities for using alternative energy sources and will prove that “clean technology and renewable energy can achieve the impossible”. Piccard, along with his partner Andre Borschberg, will have to fly 35,000 kilometers in five months. The jet takes off at Abu Dhabi and its route goes through the Arabian Sea, India, Myanmar, China, the Pacific Ocean, US, the Atlantic Ocean, southern Europe and North Africa. “From the operation point of view, this part of the world and the Middle East is the best location for us to start because it gives us the possibility to fly over India and China very early in the season. It also gives us the possibility to be back in summer with relatively good weather,” explained Borschberg. The pilots planned to make total of 15 landings every five days of continuous flight. Speed is expected to vary from 50 to 100 kilometers per hour. Batteries built into wings will charge during the day time and should be enough for all night flights. While the jet weighs a bit more than an off-road car – some 2,300 kilos, its wingspan of 72 meters is basically the same as the Superjumbo Airbus A380. Thirteen years ago when the project was launched, no one in the aviation industry took it seriously. Despite ignoring endless jokes, another challenge was to find aircraft engineers to assemble the jet as nobody thought that it would be possible. “I think we have more people from outside the field of aviation than inside,” says Borschberg. The Solar Impulse 2 aircraft completed its first flight in June 2014 from Switzerland and the pilot testing it said that a small vibration at 1,800 meters high was the only uncomfortable thing. While the crew hopes to take off on Saturday, the jet’s destiny will mainly depend on the weather. Borschberg and Piccard will change with one another at the controls as the jet can be flown only by one person. A crew of 65 air traffic controllers and weathermen will support the flight from Monaco. The plane is scheduled to return to Abu Dhabi in July. The Swiss aviator Bertrand Piccard comes from a dynasty of adventurers. In 1931 his grandfather, Auguste, was the first balloonist who reached stratosphere. 30 years later his father, Jacques, oceanographer and engineer, made the first voyage to the ocean’s deepest point.